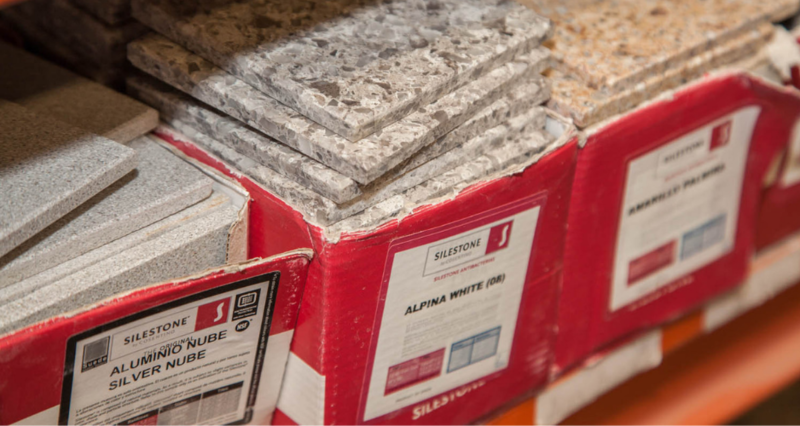 Home > Blog > Worktops > How is Silestone Made? Silestone is one of the world’s most popular quartz surfaces, and for good reason. Non-porous and highly resistant, it’s available in a wide range of colours, making it perfect for kitchens and bathrooms of all styles. Silestone is made of approximately 95% quartz, which compounds its resilience and longevity; combine such durability with its beautiful look and feel, and it’s easy to see why it’s so popular. Here, the team at Touchstone Worktops are going to detail how exactly Silestone is made into the surfaces that adorn kitchens and bathrooms the world over. All materials that pass the inspection are stored using a hermetic system, keeping them free from impurities. These are then unloaded into hoppers, before being transported via conveyor belts where it can be optimised for use. The ligand resin is stored in stainless steel drums, where it is now ready to be turned into Silestone. Using a control panel, the colour is chosen and the material is extracted from the containers – the aggregates, antibacterial protection and the resin is transported to the mixers. Once mixed, the mass is transported to a press, via a distributor which ensures the mixture is spread out as evenly as possible. The press gives the material the consistency required, and using a vacuum cleaning system combined with a consistent vibration pattern, air is removed from the mixture. Once the air is removed, the mass is put in an oven for 30 minutes at 100 degrees centigrade, and then it is left to cool naturally for 24 hours. Once it is cool, a calibration process ensures the thickness is correct and the surface is polished to ensure it its shine meets the customer’s requirements. Excess material is removed using milling drills, and the Silestone logo is branded onto the mass. Finally, the trademark finish is added via a polishing process. Once the batch has been finished, it undergoes another quality control assessment to ensure it is of the correct size, shape, shine and tone. It is then stored in the finished products warehouse where it can be sold, or it’s taken to the production factory where it can be made to measure for a customer. If the slab is to be stored, it is put in a warehouse with a capacity of 3,200 ‘boards’. Three production cells operate with enough capacity to cater for all possible orders from customers – if an order is placed, one of these cells will package and ship the Silestone to its destination. Take a look at Silestone’s livescribe video for a visual representation of how Silestone is made! The complex production process for Silestone is necessary to ensure the transformation of an assortment of raw materials into the beautiful worktops that are so popular around the world. Touchstone Worktops are very proud to be able to supply and install Silestone worktops for our customers, using our years of expertise to deliver and fit countertops with the utmost efficiency and professionalism. For more information, please get in touch with us today.